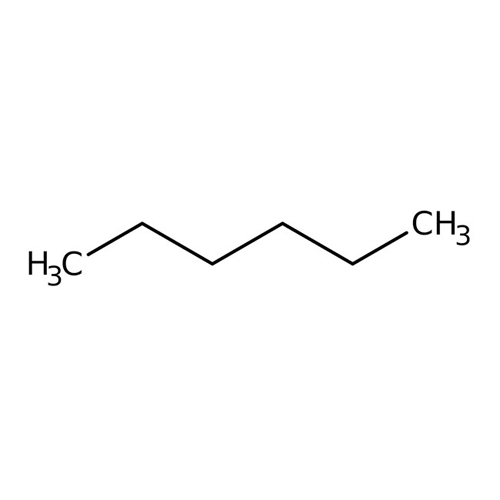 Hexane is used to extract edible oils from seeds and vegetables, as a special-use solvent, and as a cleaning agent. Acute (short-term) inhalation exposure of humans to high levels of hexane causes mild central nervous system (CNS) effects, including dizziness, giddiness, slight nausea, and headache. Chronic (longterm) exposure to hexane in air is associated with polyneuropathy in humans, with numbness in the extremities, muscular weakness, blurred vision, headache, and fatigue observed. Neurotoxic effects have also been exhibited in rats. No information is available on the carcinogenic effects of hexane in humans or animals. EPA has classified hexane as a Group D, not classifiable as to human carcinogenicity. Commercial grades of hexane are used as solvents for glues (rubber cement, adhesives), varnishes, and inks. Hexane is also used as a cleaning agent (degreaser) in the printing industry. Hexane is used as the liquid in low temperature thermometers. The most probable route of human exposure to hexane is by inhalation. Individuals are most likely to be exposed to hexane in the workplace. The main use of hexane is as a solvent to extract edible oils from seed and vegetable crops (e.g., soybeans, peanuts, corn). Monitoring data indicate that hexane is a widely occurring atmospheric pollutant. Laboratory tests can detect a breakdown product of hexane in urine. No information is available on the reproductive or developmental effects of hexane in humans. No information is available on the carcinogenic effects of hexane in humans or animals.